My writing and research practice engages with concepts of speculative futures, non-anthropocentric ontologies, post-humanism and non-human perception, animism, and the Anthropocene. I often explore these concepts through art theory and criticism because I view art and design as practices capable of radical imagining, providing opportunities to reflect on new ideas and configurations. The Ark aimed to focus on developing the role of artwork in relation to science, spirituality and politics, in order to provide a platform for thinking about the contemporary global crisis and how to imagine a future beyond our current horizons. As the writer in residence, I kept a daily log of my experience during the project, which is composed here alongside paintings by fellow participant Rebecca Farr. 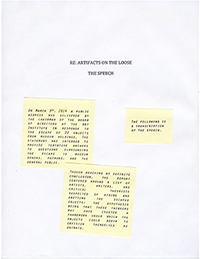 After having been approved for publishing by the curator and editorial staff, the publication was withdrawn by the artist. This text incorporates correspondence surrounding the publication as a further way of investigating and representing the project.